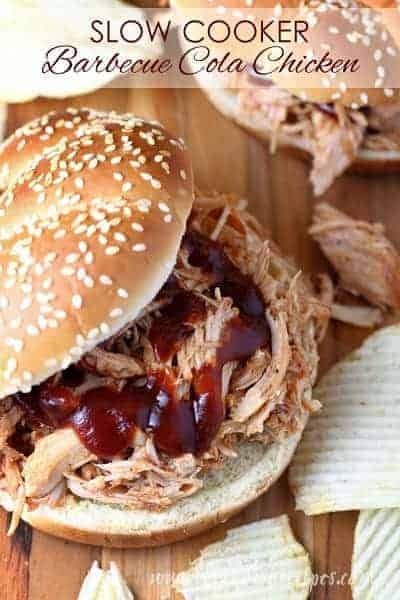 EASY SLOW COOKER BBQ CHICKEN — Slow cooked, shredded chicken in a tangy homemade barbecue-style sauce. Perfect for sandwiches, tacos and more! 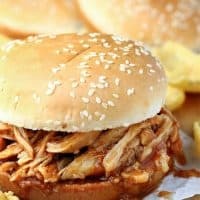 I’m always looking for easy slow cooker recipes that my whole family will enjoy and this Easy Slow Cooker BBQ Chicken definitely fits the bill. Yes, I’ve gone the super easy route and dumped a bottle of barbecue sauce into the slow cooker with some chicken. Sometimes life just calls for that sort of thing. As a mom to three busy boys, I’m all for dumping dinner in the slow cooker in the morning and calling it good. But it really doesn’t take much more effort to add the few extra ingredients that make this chicken extra special. And that little bit of extra effort makes a big difference! 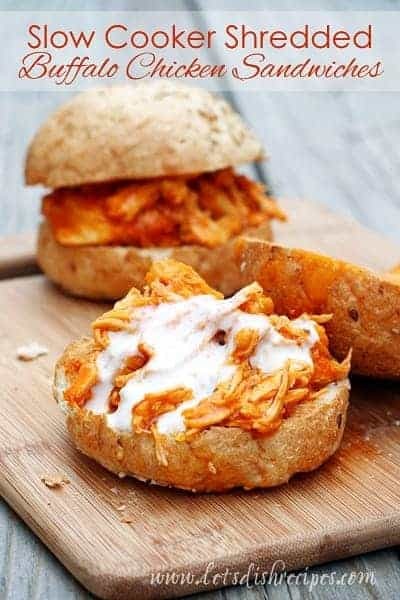 We typically serve this on sandwich buns topped off with coleslaw, but it’s also great over rice. If you have leftovers, this chicken is great in wraps and salads. And if you plan ahead, you can double the recipe and freeze enough for another meal. There’s nothing better than having something tasty prepped for those times life gets really crazy. This is also a great meal to take to someone who just had a baby or spent time in the hospital. It’s total comfort food that is loved by both kids and adults alike. I’ve had so many people tell me that this recipe is a family favorite, and it’s easy to see why. It easy, delicious, and always a hit whenever I serve it. I hope you and your family love it as much as we do! 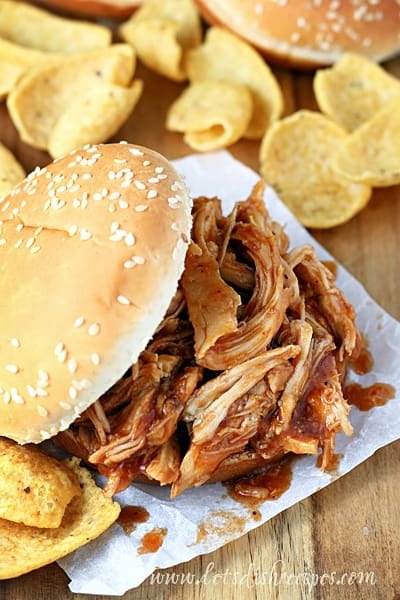 Be sure to save this Easy Slow Cooker BBQ Chicken recipe to your favorite Pinterest board for later. 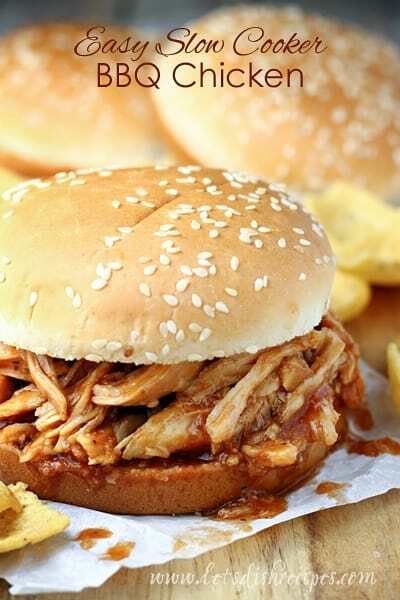 Slow cooked, shredded chicken in a tangy homemade barbecue-style sauce. Perfect for sandwiches, tacos and more! Season chicken with salt and pepper, then place in a lightly greased slow cooker. In a medium bowl, stir together remaining ingredients and pour over chicken. Remove chicken from slow cooker and shred with two forks. 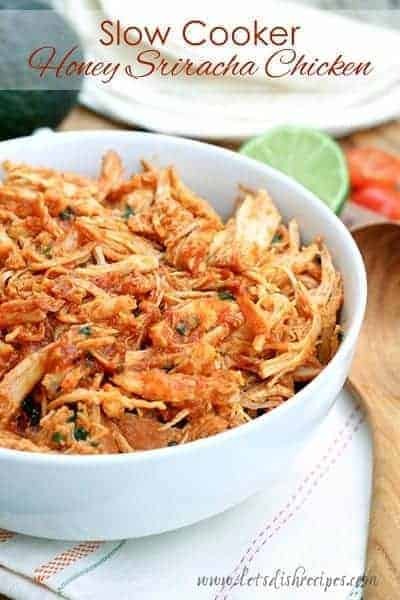 Return shredded chicken to sauce for 10-15 minutes before serving. Who Dished It Up First: Adapted from Family Fresh Meals. Easy and slow-cooker, two glorious words to hear for a weeknight dinner! Looks so good! Looks so good. I’m always up for a new crockpot recipe.